SharpZipLib provides best free .NET compression library, but what if you can't use it due to the GPL license? I'll look at a few options, ending with my favorite - System.IO.Packaging. Linking this library statically or dynamically with other modules is making a combined work based on this library. Thus, the terms and conditions of the GNU General Public License cover the whole combination. As a special exception, the copyright holders of this library give you permission to link this library with independent modules to produce an executable, regardless of the license terms of these independent modules, and to copy and distribute the resulting executable under terms of your choice, provided that you also meet, for each linked independent module, the terms and conditions of the license of that module. Bottom line In plain English this means you can use this library in commercial closed-source applications. I'm pretty sure that the reason for this odd "sort-of-GPL" license is because some of the SharpZipLib is based on some GPL's Java code. However, most companies have policies which forbid or greatly restrict their use of GPL code, and for very good reason: GPL has been set up as an alternative to traditional commercial software licensing, and while it's possible to use GPL code in commercial software, it's something that requires legal department involvement. So, my bottom line is that I can't use your code due to your license. UPDATE: DotNetZip has been released on CodePlex, and the one issue I ran into has been fixed. I'd recommend giving this a try instead of System.IO.Packaging (as I'd originally recommended), because it's a lot easier to use. The Zip format allows for several different compression methods, but the most common is Deflate. System.IO.Compression includes a DeflateStream class. You'd think that System.IO would include Zip, but... no. The problem is that, while System.IO.DeflateStream can write to a stream, it doesn't write the file headers required for Zip handlers to read them. Microsoft Interop blog posted a .NET Zip Library which adds the correct headers to the output of a System.IO.Compression DeflateStream. Note: DotNetZip has been released to CodePlex, and the issue I reported has been fixed. The resulting Zip will contain File.txt, but it will be within the \My Documents\Sample\ hierarchy. There's no way to control the structure of the zip file when you add individual files, unless you want to modify the zip library (which is under MsPL license). That proved to be a big problem in my case, because the zip structure I'm creating is pretty rigid. So, if you're just zipping an entire folder full of files, this library may work for you, but if you need more control you may need to modify the library. I'm guessing if this were published on CodePlex it would have been fixed a while ago. Another larger problem to keep in mind is that stream based compression is much less efficient than file based compression. File compression can optimize the compression used based on the content of all included files; stream based compression compresses data as it comes in, so it can't take advantage of data it hasn't seen yet. J# has included zip since day one, to keep compatible with the Java libraries. So, if you're willing to bundle the appropriate Java library (specifically, vjslib.dll), you can use the zip classes in java.util.zip. It works, but it seems like a really goofy hack to distribute a 3.6 MB DLL just to support zip. In .NET 3.0, you can use the the System.IO.Packaging ZipPackage class in WindowsBase.DLL. It's just 1.1 MB, and it just seems to fit a lot better than importing Java libraries. It's not very straightforward, but it does work. The "not straightforward" part comes from the fact that this isn't a generic Zip implementation, it's a packaging library for formats like XPS that happen to use Zip. First, you'll need to find WindowsBase.dll so you can add a reference to it. If it's not on your .NET references, you'll probably find it in C:\Program Files\Reference Assemblies\Microsoft\Framework\v3.0\WindowsBase.dll. One weird side-effect of using the ZipPackage to create Zips is that Packages contain a content type manifest named "[Content_Types].xml". If you create a ZipPackage, it will automatically include "[Content_Types].xml"., and if you try to read from a ZIP file which doesn't contain a file called "[Content_Types].xml" in the root, it will fail. You'll notice that the compression in my test is not that great. In fact, pretty bad - Notepad.exe got bigger. Binary files don't compress nearly as well as text-based files - for example, I tested on a 55KB file and it compressed to less than 1KB - but the compression in this library doesn't appear to be fully implemented yet. For example, the CompressionOption enum includes CompressionOption.Maximum, but that setting is ignored. Normal is the best you'll get right now. Another possible reason for low compression ratios in this sample is that I'm adding files separately rather than adding several files at a time. As I mentioned earlier, Zip compression works better when it has access to the entire file or group of files when creating the archive. You can use the packaging library for your own file format. For example, here's an example that stores object state using XmlWriters to write to a Zip stream. That's a good question. All the Zip handling in System.IO.Packaging is in an internal class MS.Internal.IO.Zip. It would have been a lot more useful to implement a public System.IO.Zip which was used by System.IO.Packaging so that we could directly create and access Zip files without pretending we were creating XPS packages with manifests and Uri's. Jon, if you think a CodePlex project would be in order for the Zip library, I am happy to launch it. I cannot believe it has taken until .net 3.0 for this to have been added. You have to wonder that if you end up having to write wrappers around this just to make using the objects easier that people will just stick with SharpZipLib "'cause it works"
If I'm not mistaken the initial (.NET 1.1 and .NET 2.0) available compression libraries from System.IO.Compression is not based on the Zip algorithm, but rather, on the GZip standard. Hence the problems with compatibility in deflation. I've posted a few times about SharpZipLib, including some working code samples. I've also put in a lot of work in support of Mono, by co-founding the Monoppix Linux Live CD project. Yes, there are good external libraries (GPL, products like Xceed, etc. ), and we're both happy to use them when appropriate. If your goal is to compress data for code you're not going to distribute, the title of the post should tell you that you've come to the wrong place. This post is about creating zip archives without external libraries. There are times when you want to distribute your application without someone else dictating your license, and that doesn't just include selling them. I'm sure that you've encountered this when you were selecting your license in your projects on CodePlex, SourceForge, Google Code, etc., right? Your FUD comment is silly rhetoric - it's a fact that SharpZipLib is under GPL, and I was speculating on why that might be. I can't conceive of how that speculation could cause frear, uncertainty, or doubt - the fact is that it's under GPL. - GZip is an archive format, made of a header, compressed data and a footer. The header contains a field that tells what compression algorithm was used. It happens that it's ALWAYS deflate. - Zip is another (better) archive format, also made of headers, compressed data, footers et al. The header also contains a field that tell what is the compression method. It happens that Deflate is the most popular and supported, though better compression algorithms exist. - .NET 2.0 has the DeflateStream, which compresses data using the Deflate algorithm, but does not add a header or footer. - .NET 2.0 also has the GZipStream, which uses the DeflateStream underneath, and also creates a header and footer. Great post! I was writing the same post last week but yours is way better! Thanks for doing the homework. I tried using DotNetZip but unfortunately it just doesn't currently have enough options. For example, it doesn't support password-protecting the file and also doesn't stream the compressed contents to disk until it is done. In my case, I'm trying to programmatically compress and encrypt multi-gigabyte database backups but DotNetZip's limitations currently don't work for me. I do hope though that the creators of DotNetZip continue to develop it because all the other options are just not ideal. How can one unzip programmatically with the "WindowsBase.dll" file? The zip is OK and works. Nice. However, if one unzips the created zip file (using >Windows XP Pro, >Windows Explorer, >Right click, >Extract All), then one will note that it puts all the files into 1 output directory. That is, the folder stucture is not preserved in any way. Is there a way to preserve the folder structure? I really do not understand your point of view on the GPL modified license "problem" with SharpZipLib... What is the issue when distributing commercial products that use SharZipLib considering this license terms exception ??? Moreover, what is the difference between your library and SharpZilLib... I mean : what do you mean with "without an external library" ? Your code is distributed as source archive or assembly, just as SharpZipLib, did I miss something ? thanks for your time in researching this article. i have been looking for a solution. I agree about the code sample you show. i think the code complexity of most actions in dotnet is fine for the guy writing it, but when a stranger somes back to maintain it, the problems arise. time is money. Create a directory inside the ZIP using your method. Hello! I'am have some trouble. I want create ZIP package with RUSSIAN files, and before creating archive i have bad-russian. How insert russian string in ZIP? I am very appriciate you. But the problem is, how can we avoid for generating [content-type].xml file. My client is not required this file. Please let me know to fix this. Hello!, as you mentioned, the library automatically adds a xml file ([Content_Types].xml) and if you read the zip file without that file, it does't work. But if I don't want that xml file in my zip, is there any way to remove it? 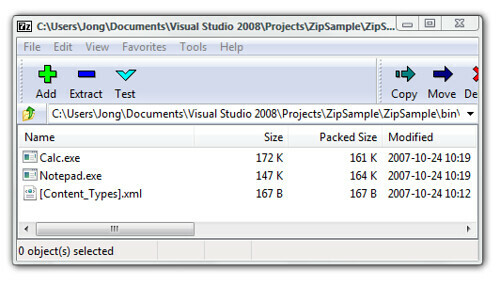 jon, great post... how did you solve the folder structure when adding files in a zip file using DotNetZip lib? I have used System.IO.Packaging - ZipPackage class in WindowsBase.DLL, but for some of the download its giving the error Cannot access the closed Stream. When i check the zip file few files are added to the zip and not all. I just wasted a day trying to use this approach to read and write zip files. The author fails to mention some of the major gotchas you'll likely encounter using these poorly designed .NET classes. First, the file names in the archive will be URL encoded! "My Stuff.txt" will be saved in the archive as "My%20Stuff.txt". Next, the Package.Open(stream,...) methods are ridiculously restrictive on what type of FileStream they'll accept. I wasted hours before learning that it will NOT accept a FileStream that was created via File.Open, no matter what FileMode, FileAccess options I used when opening it. Create a FileStream using "new" instead. Finally, the deal breaker: reading a zip file! The author provided no example of this. Calling Package.Open() on existing file succeeds, but calling GetParts() simply returns an empty array. Microsoft's example of reading a package relies on package relationships being established. I'm not sure its even possible to create the file created in the example above using the ZipPackage class. Lol! I really like this! Does anyone know if the System.IO.Packaging method still creates a [content_types].xml file inside the zip? I can't have any unwanted file(s) in my zip because of automation purposes. Dunno if this has been mentioned but if you're online, you can go to open zip file to open zip files. It's super easy and hope that helps someone! If you're not exactly sure if you have been infected with the herpes virus, it is wise to see a medical professional as soon as possible. Melasma is a very common affliction and can be addressed by using a quality skin lightening cream and moisturizer as directed. time so it's not over done. After 5 minutes, turn the pizza 180 degrees to insure even cooking. You might need to dust your rolling pin with flour too, if the crust sticks to it too much while you are rolling. Add the water a teaspoon at a time so it's not over done. a persistence of cooling of the pizza stone. into little cubes. It didn't help that every pizza recipe I saw online would mention the dreaded "bread machine. for flood-hit farmers owning 25 acres of land. These exercises aren't included in sort pattern of movements. So the sensitive information supposed to have to protect from access by others. swing dress using a matching cardigan in red and blue with white buttons. years ago but she grew up in San Diego, the land of perpetual slim. Online broke this news early this morning on March 7. Falling merely a couple of lbs weekly can certainly make botanical slimming soft gel strong version pretty obvious creates a limited stretch of time. Fast weight loss has not been your intelligent selection in regards to reducing weight; for that reason an operation may possibly botanical slimming soft gel strong version possess a spectacular outcome on our bodies and may even cause you to be develop into sick and tired because of some sort of poor nutrition. is not one of these methods. This software can be introduced to computers via the Internet. Activity obviously realizes this. Passwords using ardamax Keylogger. Anytime, there are still some clues that can help you to narrow your choices. out what their online activity could be crucial. Personal media is the exact latest buzz on the internet. Unfortunately just recognizing additionally praising employees is just not enough.